Fireworks Controller Tutorial #4thOfJuly #4thOfJulyProjects « Adafruit Industries – Makers, hackers, artists, designers and engineers! Check out this awesome build from instructables user systemf92 that’s just in time for the 4th of July. But, remember, SAFETY FIRST! 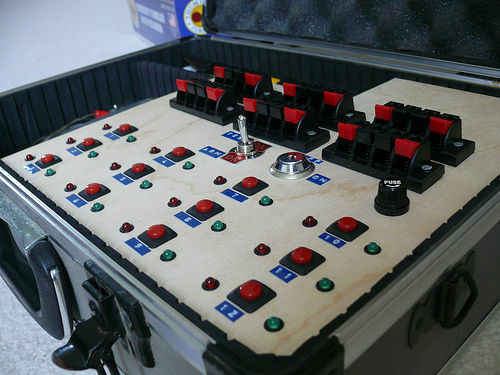 This instructable is on a 12 channel fireworks controller that I built during the summer. It was a lot of fun to build, and is a blast (pardon the pun) to operate! I couldn’t find a good quality instructable on building a complete fireworks controller like this one, so I decided to write my own. The information contained herein is for the sole purpose of information and education. Build this project AT YOUR OWN RISK. I have NO responsibility whatsoever for any injury, death, legal issues, encounters with law enforcement, or damage to property of anyone operating or involved with using this fireworks controller. In no event will the author be liable for any loss or damage including without limitation, indirect or consequential loss or damage, or any loss or damage whatsoever arising from the use of, or in connection with the use of this firework ignition controller. Look up your local and state laws regarding pyrotechnics before starting this project and make your own smart decisions when it comes to using it.